With a new character, new technology and a new name, the ŠKODA SCALA completely redefines the compact car segment for the Czech brand. The fitting name ‘SCALA’ comes from the Latin for ‘stairs’ or ‘ladder’. The hatchback combines an emotive design with a high level of functionality as well as state-of-the-art connectivity, and transfers the sensational design language of the VISION RS concept study into a production vehicle for the first time. A selection of five engine variants is available, with power outputs ranging from 66 kW (90 PS) to 110 kW (150 PS). In addition, the SCALA offers a high level of active and passive safety, full-LED headlights and tail lights, plenty of space for luggage and passengers, as well as numerous Simply Clever features. It will be launched onto the market in the first half of 2019. Press texts, infographics, footage and photos are available in the interactive press kit at ŠKODA Storyboard. By launching the SCALA, ŠKODA is taking several steps in development at once and is completely repositioning itself in the compact car segment. With its excellent connectivity, high-quality equipment and exquisite materials, it perfectly represents the brand’s set of values, which are suitably encapsulated by the term ‘smart understatement’. The SCALA thereby also appeals to a target group of younger, design-focused Internet users, who also attach importance to enjoying the ŠKODA-typical generous amount of space, the largest boot in the segment and great value for money. Exterior design: The ŠKODA SCALA is the first ŠKODA to implement the next development stage of the brand’s design language, and is doing so in a very emotive and authentic way. It is the first ŠKODA production vehicle in Europe to bear ‘ŠKODA’ in block lettering across its tailgate instead of the ŠKODA logo – and it does so with confidence. Alloy wheels measuring up to 18 inches create dynamic accents; the unique, extended rear window available in the Emotion package gives the ŠKODA SCALA its own style. Interior design: The new interior is based on the VISION RS concept study. It combines ergonomics and emotiveness with a ŠKODA-typical generous amount of space and the largest boot in the segment. Just like the front door trims, the instrument panel with its central touchscreen positioned high on the dashboard also features a high-quality, soft-foam surface with a new specific texture resembling crystalline structures. A pleasant atmosphere is created by the ambient lighting, warm hues and contrasting coloured stitching on the seat covers, which are optionally available in a Suedia microfibre. As options, the heated windscreen and heated steering wheel provide additional comfort. Engines and chassis: Three 1.0-litre or 1.5-litre TSI engines and a 1.6-litre TDI produce power outputs ranging from 70 to 110 kW (95 to 150 PS). The 1.0 G-TEC delivering 66 kW (90 PS), which is designed to run on environmentally friendly natural gas (CNG), will follow later in 2019. The five efficient turbo engines fulfil the Euro 6d-TEMP emissions standard, of course. The Sport Chassis Control is available as an option – a chassis that can be switched between ‘Normal’ or ‘Sport’ modes via Driving Mode Select. Assistance systems: Many of the ŠKODA SCALA’s assistance systems have previously only been seen in higher vehicle segments. The optional Side Assist function shows if a vehicle is approaching from behind and wants to overtake or if it is in the blind spot up to 70 m away – 50 m further than in Blind Spot Detect. Adaptive Cruise Control (ACC), which can be used at speeds of up to 210 km/h, and Park Assist are also optional. Lane Assist and Front Assist with City Emergency Brake come as standard. Technology and safety: The SCALA features LED headlights and tail lights as standard, full‑LED versions are available as an option and – for the first time in a ŠKODA – come with dynamic rear indicators. The car features up to nine airbags, including a driver knee airbag and, for the first time in the segment, optional rear side airbags. In the event of an impending collision, the optionally available proactive occupant protection system Crew Protect Assist automatically closes the windows and tensions the front seat belts in good time. Infotainment: The optional Virtual Cockpit features a 10.25-inch display – the largest in the segment. Infotainment systems from the third generation of the MIB modular infotainment matrix come with a screen size ranging from 6.5 inches up to 9.2 inches. The touchscreen is positioned comfortably high on the dashboard in clear view of the driver and front passenger; the optional ŠKODA Sound System features a subwoofer and ten speakers. Using lots of new ŠKODA Connect mobile online services, the car can be locked and unlocked via a mobile phone and the infotainment system software or maps can be updated, for example. The SCALA is always online thanks to a built-in eSIM with LTE connection. Simply Clever: The ŠKODA SCALA comes with numerous Simply Clever features, including – for the first time in this segment – an electric tailgate incl. Tip-To-Close function and a retractable tow bar, which can be electrically unlocked at the push of a button in the boot. The new ŠKODA SCALA is the first production model to demonstrate the next development stage of the brand’s design language, which will also shape the car manufacturer’s future models. New sculptural shapes, dynamic design features as well as precision-designed details lend the SCALA a distinct identity. The new compact car is ŠKODA’s first production vehicle in Europe to bear ŠKODA lettering across its tailgate instead of the brand’s well-known logo. With its perfect proportions, clearly defined surfaces, flowing lines and advanced aerodynamics, the new ŠKODA SCALA comes across as modern and sporty. The front is striking with an upright radiator grille, a large air inlet underneath and side Air Curtains. The ŠKODA-specific tornado line makes the vehicle look longer and is in perfect harmony with the car’s dynamic roofline. The aerodynamically optimised roof spoiler and the sporty diffuser underneath the bumper shape the wide rear. As an alternative to the standard tailgate, the car can be ordered with an extended rear window. In this case, the ‘ŠKODA’ lettering is featured on the window itself. In addition to the extended rear window, the Emotion package comes with a large panoramic glass roof including an electrically retractable sunblind as well as full-LED headlights and tail lights. Innovative LED headlights and tail lights also shape the ŠKODA SCALA’s appearance and showcase the brand-typical crystalline features, which are emphasized by the ŠKODA Crystal Lighting lettering. The headlights are narrow and tapered; the razor-sharp designed tail lights with rear fog light shine in the brand-typical ‘C’ shape. The SCALA is the first ŠKODA to offer dynamic rear indicators as an optional extra. The indicators are divided into individual LEDs. When the driver turns the indicators on, they flash outwards in a sweeping motion. The dynamic indicators are easily noticeable by road users, even in bad weather – an important contribution to improved road traffic safety. The range of wheels available for the ŠKODA SCALA starts with 15- and 16-inch steel wheels. Furthermore, there are numerous alloys ranging between 16 and 18 inches to choose from. The 16‑inch Hoedus, 17-inch Propus and 18-inch Vega Aero wheels are new to the line-up. All three come in gloss black and have been aerodynamically optimised to make the car more streamlined. The new concept for the ŠKODA SCALA’s interior combines ergonomics and emotiveness with a ŠKODA-typical generous amount of space and a 467-litre boot – the largest in the segment. Furthermore, the SCALA is the first ŠKODA to feature the latest generation of infotainment systems with a free-standing screen positioned high on the dashboard in clear view of the driver; in addition, the optional Virtual Cockpit features the largest display in the segment. Added to that are new decorative trims and exquisite materials such as the soft plastic surfaces with a specific texture. The emotive design language of the VISION RS concept study has been transferred into the interior of a ŠKODA production car – the ŠKODA SCALA – for the first time. With the optional Virtual Cockpit featuring a 10.25-inch display – the largest in the segment – the driver has the SCALA’s innovation in direct sight at all times. The emotive design language of the exterior is seamlessly continued on the redesigned instrument panel. A characteristic line frames the free‑standing screen positioned high on the dashboard in clear view of the driver and echoes the shape of the bonnet. It also forms an ergonomic hand rest for operating the touchscreen. The dashboard, with its new, extensive decorative elements, and the front door trims feature a high‑quality, soft-foam surface with a new specific texture resembling crystalline structures. This will shape the ŠKODA brand’s style in future. The ambient lighting with a white or red light, the warm hues and contrasting coloured stitching on the seat covers provide a pleasant feeling of spaciousness. As an option, the seat covers are available in an exquisite Suedia microfibre. To provide additional comfort, the ŠKODA SCALA can be optionally equipped with a heated windscreen, heated steering wheel and heated rear seats. In the brand’s typical style, the ŠKODA SCALA offers a very spacious interior, which comes close to that of the ŠKODA OCTAVIA. This is thanks to its long wheelbase measuring 2,649 mm, which allows for a generous rear kneeroom of 73 mm. The elbowroom in the rear is 1,425 mm; at 982 mm, the rear headroom is the most spacious in this segment. The ŠKODA SCALA has a boot capacity of 467 l – also giving it the largest boot in its segment. This increases to 1,410 l with the rear seats folded down. 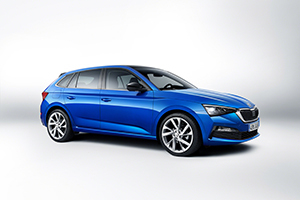 The new SCALA is the first ŠKODA based on Volkswagen Group’s state-of-the-art MQB A0 platform. The MQB is a uniform basis for numerous different cars. The modular transverse matrix makes extremely flexible and efficient production possible, thus allowing numerous innovative assistance systems from higher vehicle segments to also be offered in the compact car segment. The advantage of Volkswagen Group’s modular transverse matrix (MQB) is that the installation position of the transverse engines, which are tilted slightly forward, and the distance from the middle of the front wheels to the pedals are always the same. This allows for uniformity in the front end across all models and plenty of space in the interior’s front section. Other dimensions such as wheelbases, track widths, wheel sizes and seat positions are variable. Engines, transmissions, steering and chassis components can all be used in a modular way and combined in various ways. The MQB significantly contributes to keeping the weight down thanks to its use of modern designs and high-strength steel. Thanks to the large number of MQB models, it is possible to not only offer innovative assistance and safety systems such as Adaptive Cruise Control or proactive occupant protection system Crew Protect Assist in higher vehicle segments, but also in smaller models. ŠKODA has made comprehensive adjustments to the platform for the new SCALA, which include using the longest possible wheelbase and rear overhang. The result is a typical ŠKODA – extremely spacious combined with compact external dimensions. This is predominantly thanks to the long wheelbase of 2,649 mm within a total length of 4,362 mm. The new compact car has a width of 1,793 mm; its height is 1,471 mm. The modular transverse matrix also helps to streamline the car – the ŠKODA SCALA has an excellent drag coefficient (cd) from 0.29. Just like other ŠKODA models based on the MQB, the new compact car also uses underbody covers for better air flow. In addition, there’s a choice of three newly developed alloy wheels that come with air-directing vanes. The body of the ŠKODA SCALA offers less air resistance thanks to its smooth and streamlined body components; Air Curtains guide the air around the sides of the front bumper in a controlled manner. The water channels on the windscreen are aerodynamically optimised and the engine cooling features optimised air-guiding parts. On the roof spoiler, little built-in finlets improve the aerodynamics. Numerous passive safety systems and assistance systems that were previously only available in higher segments make the new ŠKODA SCALA one of the safest vehicles in the compact car segment. As a first in its segment, the SCALA is equipped with LED technology for the headlights and tail lights as standard, with a full-LED version available as an option. In the event of an impending collision, the optional proactive occupant protection system Crew Protect Assist quickly and automatically closes any open windows and pre-tensions the front seat belts. Following an accident, Multi-Collision Brake prevents the vehicle from rolling any further in an uncontrolled manner. To make driving safer and provide better vision in the dark and in poor weather conditions, the ŠKODA SCALA is the first in its segment to come equipped with innovative LED technology for the dipped beam and daytime running lights as well as for the tail, brake and rear fog lights as standard. In the optional full-LED version of the headlights, a bi-LED module is used for the dipped and high beam; three additional LEDs are used for the cornering lights. The daytime running lights and indicators are provided by a narrow LED strip in the upper part of the headlight unit, and illuminated needle-like crystalline LED structures along the bottom of the unit catch the eye. The full-LED version of the tail lights also comprises the reversing light as well as – for the first time in a ŠKODA – dynamic indicators. The indicators are made up of individual LEDs. When the driver uses the indicator, these LEDs illuminate one after another, sweeping from the inside and towards the outside of the car. The dynamic indicator is very easy to see by other road users, even in poor weather conditions. It thereby provides an important contribution to increased road traffic safety. Thanks to two radar sensors at the rear of the car, the optional Side Assist detects vehicles approaching from behind and wanting to overtake or that are in the car’s blind spot. The driver is informed of this using an LED signal on the inside of the wing mirror housings (this way, the warning is even more noticeable for the driver). While the existing Blind Spot Detect has a range of up to 20 m, Side Assist can detect vehicles up to 70 m away and thus also effectively warns the driver of hazardous situations on motorways and dual carriageways. Rear Traffic Alert is an integral part of Side Assist. It warns the driver about objects moving behind the vehicle when reversing. Lane Assist and Front Assist with City Emergency Brake are included in the ŠKODA SCALA’s standard equipment. Using a camera, Lane Assist recognises lane markings and helps the driver to keep the car in lane. Front Assist, which includes the City Emergency Brake and Predictive Pedestrian Protection functions, monitors the area in front of the car while driving in the city, thereby helping to prevent accidents. The optional Driver Alert fatigue detection system emits a warning when it recognises that the driver’s concentration is waning. Adaptive Cruise Control (ACC) is designed for use during long journeys on the motorway. At speeds of up to 210 km/h, it automatically adjusts the speed of the car based on the vehicles ahead and, in combination with a DSG, can even brake the car until it stops. Within three seconds of being stationary, ACC is also able to automatically make the car pull away again. The optional rear-view camera and Park Assist, which automatically manoeuvres the SCALA into and out of parallel and bay parking spaces, lend the driver a hand when parking. The system comes equipped with Manoeuvre Assist – if the sensors detect a dangerous obstacle in front of or behind the car during parking, the car brakes automatically. Auto Light Assist is also available as an option. This uses a camera to detect oncoming traffic as well as vehicles travelling ahead of the SCALA and automatically dips the headlights. Along with the new interior concept, which appears for the first time in the SCALA, ŠKODA has also equipped the new model with the latest digital technology. The optional Virtual Cockpit, which can be flexibly configured to suit the driver’s needs, features a 10.25-inch display – the largest in the compact car segment. The infotainment systems’ central touchscreens each measure up to 9.2 inches and thus also set a benchmark within the segment. And thanks to its built-in eSIM, which comes as standard, the SCALA is the first ŠKODA to be always online. It also offers Emergency Call and Proactive Service to all customers. The Infotainment Apps are now available for the top-of-the-range Amundsen infotainment system. The optional Virtual Cockpit can be individually customised and offers the driver a choice of five different views. These range from the Classic layout – displaying both a large speedo and the rev counter in the style of round, analogue instruments – to the Basic, Modern and Sport layouts as well as the Extended layout, which integrates the map from the Amundsen navigation system on a large scale. In addition, in its different configurations the Virtual Cockpit also displays relevant vehicle and driving data, radio stations, active assistance systems or navigational information. The top-of-the-range Amundsen infotainment system as well as the Bolero and Swing systems belong to the latest-generation of the infotainment systems. The free-standing central display, which is part of all systems, is positioned high on the dashboard in clear view of the driver. The Amundsen system currently always comes paired with the Virtual Cockpit and offers a 9.2-inch display with a glass front. The system can be navigated using the touchscreen as well as voice or gesture commands. Other features include 3D navigation, a 64-GB SSD hard drive used for maps, Internet access and an optional Wi‑Fi hotspot. The Bolero infotainment system features an 8-inch glass display and comes with Bluetooth connection and SmartLink+ technology. Wireless SmartLink+ technology is an optional extra, allowing wireless connection to smartphones. Both the Amundsen and Bolero systems are equipped with a total of eight speakers in the doors as standard. The ŠKODA Sound System is optional, and provides an additional speaker in the centre of the dashboard, a subwoofer in the boot and an amplifier for a particularly impressive sound. The Swing infotainment system is the base system for the ŠKODA SCALA and offers a 6.5-inch display and four speakers in the front, to which four speakers in the rear as well as a Bluetooth connection and SmartLink+ can be added. The Phonebox, which provides wireless connection to the car’s aerial and inductive charging, is available as an option for all infotainment systems. The SCALA is the first ŠKODA to be always online. What’s more: due to the latest generation of mobile online services, it offers a new and flexible concept for individual Infotainment Apps, allowing the customer to benefit from various online options and additional features. The built-in eSIM establishes a high-speed, LTE Internet connection, meaning there is no longer any need for an additional SIM card or a tethered connection via a smartphone. For the first time in a ŠKODA, the eSIM, which supports the Emergency Call and Proactive Service functions, comes as standard. Emergency Call, which is mandatory in the EU, automatically makes an emergency call in the event of an accident, but can also be activated manually at any time. If an accident occurs, the Proactive Service relays the vehicle’s position as well as information about its status. Apart from that, it can archive information about the car’s status as a one-off or at regular intervals and it keeps the ŠKODA SCALA in contact with the garage, allowing service notifications to be relayed or service appointments to be scheduled. The software for the infotainment system and the navigation map can now also be automatically updated ‘over the air’, as frequently as desired. It is also possible to download additional Infotainment Apps.There is therefore no need to visit a garage. The ŠKODA SCALA’s online services package includes a wealth of infotainment features, such as remote vehicle access and selected Infotainment Apps from new ŠKODA InCar Shop – which can be conveniently accessed via the car’s central touchscreen. These Infotainment Apps include a weather app capable of displaying weather conditions for the whole of Europe, and a news app, which allows users to set up a news feed subscription from the SCALA’s infotainment touchscreen. Additional apps will come in the future, which will also be backward compatible. The integration of Online Traffic Information in real time allows the Amundsen navigation system to provide more accurate and reliable route suggestions and estimated journey times. Compared to the system’s previous generation, these suggestions and estimations are now also populated more quickly. In the event of a traffic jam alternative routes are calculated and updated in real time. The parking and petrol station functions, which display available spaces or current fuel prices and can amend the navigation system’s route guidance accordingly, are now also backed by online data. The ŠKODA SCALA’s online and offline functions seamlessly merge into each other and the passengers do not have to switch between them manually. In addition, access to the ŠKODA Server helps to improve the infotainment system’s new voice control feature, allowing it to understand complete sentences as well as dialects. The newly designed ŠKODA Connect app for mobile phones and smartwatches or the ŠKODA Connect web portal provide Remote Access and enable for the ŠKODA SCALA to be locked and unlocked remotely (Remote Lock/Unlock). It is also possible to check whether all windows are closed from a distance. In addition, car owners can conveniently call up information while on the go or at home in the living room, and find out how much fuel is left in the tank, or view and archive other vehicle and driving data such as the car’s mileage or the speeds it has travelled at. If set to do so, the SCALA can also send push notifications should it be stolen, leave a predefined area or exceeds a certain speed, for example. Remote access also provides information about where the car is parked. And makes it possible to activate the SCALA’s horn and indicators at the touch of a button, allowing the car to be found more quickly in a large car park. Furthermore, based on the current traffic conditions, the app can also remind the driver to set off in good time for their preplanned journey. In ŠKODA InCar Shop, customers can also select additional data bundles. These data can be transferred via the SCALA’s Wi-Fi hotspot to any of its passengers. A ŠKODA always comes with a variety of Simply Clever features. The Czech brand is well-known for its clever details that make day-to-day life that little bit easier for its customers. And in typical ŠKODA style, the new ŠKODA SCALA also provides a wealth of Simply Clever features – and not only the classics like the ticket holder on the A-pillar on the driver’s side, the umbrella compartment (incl. umbrella) in the driver’s door or the ice scraper in the fuel filler flap with a tyre tread depth gauge.